Photos August 2005 Mir Castle is a unique monument of Belarusian architecture, it was built by duke Ilinich in early 16th century near village Mir (Grodno Region) instead of wooden feudal farmstead, which existed there in 15th century. This is a square-planned building with towers at the corners. The fifth tower had a drawbridge and a forged grille chersa which could urgently stop a sudden attack. The castle was well adapted for gunshot defense. Its walls had two rows of loop-holes, and its towers were intended for heavy cannon shooting from them. The basis of the volumetric castle's composition is its high towers which jut out beyond the wall-line. All of them have the same structure - tetrahedral core with octahedral top, but they differently decorated which gives original decorative value and beauty to the castle. 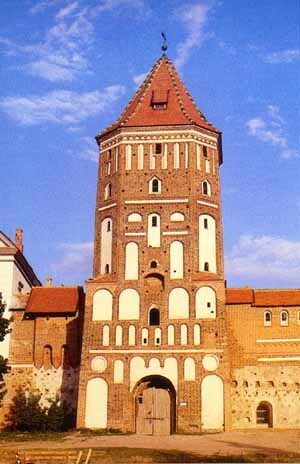 The representational means, characteristic for Belarusian Gothic, were used for plastic decoration of the Mir Castle: Gothic bricklaying (alternation of long and short sides of bricks) with walled up bricks, division of walls with plastered niches of various forms ornamental brick belts. 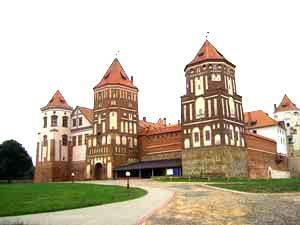 Since 1568 the Mir Castle was owned by Dukes Radziwils, who finished its building in Renaissance style. A three-storied palace was built along the eastern and northern walls. Its plastered facades were decorated with lime-stone portals, plates, balconies and porches. During excavations they collected a lot of glazed tiles with vegetable and geometrical ornaments, and coats of arms of the castle's owners. Earth walls were made around the castle with bastions at the corners; a water moat surround them. To the north of the walls an Italian garden was laid, to the south - an artificial lake. Despite numerous destruction's (the heaviest were during 1812 war) the Mir Castle survived till now; and at present it is being successfully restored. This monument is under UNESCO's auspices.